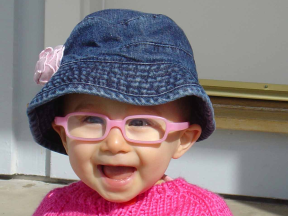 C – 14 months old; she started wearing glasses at around 7 months for farsightedness and strabismus. C’s glasses are the rectangular shape frames by Miraflex. C – 14 months old; she started wearing glasses at around 7 months for farsightedness and strabismus. C’s glasses are the rectangular shape frames by Miraflex, with an elastic tie in the back. Miraflex comes in several shapes and sizes, and should be available at any optician’s office.